The holdall was heavy, but she’d be able to carry it all the way into the cellar. The oil was worrying her now, how slippery the kitchen floor might be. There was no reconsidering though, no last minute adjustments. A good third of Glade Hall was now burning and soon the whole house would be an inferno. Emma stopped, forcing the others to come to a standstill. “Do you see them ?” She asked. Like fireflies of blue flame, flitting about at speed. Some going through walls as though they weren’t there. “I see them too. What are they ?” Asked Alex. She saw them far more clearly than as just flashes. Emma saw two stop and look at her, before hurtling off into the night. “All of them ?” Asked Leonard. She had to laugh, but not in an unkind way. A lot of troubled spirits had been drawn to Glade Hall, some were barely touched by darkness at all. Those were the phantoms she saw hurtling about in obvious panic. Through the kitchen door and two dim night lights showed the floor was free of oil. They’d deliberately run the pipes through the back of the kitchen, to slow down the advance of the oil. It would be there on their return trip though, oozing everywhere, making running impossible. Down to the first basement and everything was still normal. The rows of fluorescent lights still illuminated shelves full of tinned food and three large chest freezers. Halfway across the basement, the lights went out, as they heard an explosion somewhere above them. Emma hadn’t noticed the gentle hum of the freezers, until the sound stopped. She pulled a Maglite out of her pocket and turned on its bright LED beam. “What the hell was that ?” Asked Alex. Four flashlights and the lighting was actually better than she’d expected. The white LED beams showed everything in sharp relief. They hadn’t drilled the pipes in the basement, so there was no oozing oil to worry about. Emma went down the stairs into the second basement and saw Natalie leaning against the cellar door. Natalie was holding the large sledgehammer, the one they’d intended to use to smash open the cellar door. It had to weigh a good fourteen pounds, yet she was twiddling it around in her left hand. “Leave now, while you still can.” Said Alex. Natalie was laughing at her, but she hadn’t attacked them yet. Dean reached for an arrow, holding it ready against the Hunter’s bow. Leonard didn’t wait for orders or permission, he fired both barrels of his shotgun. The shells tore lumps of dead flesh out of Natalie, releasing the foul odour of decay. She still grinned at them in her own infuriating way. Her words sounded unconcerned, but Natalie had still hung back by the cellar door. She moved slowly towards them, swinging the sledge hammer about, as though it was a toy. Natalie was unlike any other phantom she’d seen at Glade Hall. At times she was completely corporeal, yet could vanish into the fabric of the building. She was a mystery and didn’t fit anything on Emma’s known list of wraiths, phantoms and monsters. Those lists had been created by clerics in the middle ages though, or Hollywood. Natalie was different to those fantasies, she was all too real. Natalie moved closer, but she seemed to avoid looking directly at Emma. Was she afraid ? Dean held up his bow and pulled back on the string, prompting yet more ridicule. Emma knew Dean was more disciplined than Leonard, he wouldn’t fire unless she told him to. Supposing that too didn’t hurt the phantom, then what ? The arrow hit Natalie just above her collar bone, going through her chest and out of her back, finally digging itself into the cellar door. Various pieces of long dead human tissue, clung to the arrow like pieces of confetti. Still the phantom could talk. She wasn’t quite so carefree about swinging the sledgehammer about though, it seemed to be giving her a few problems. From snide comments to screaming in a matter of seconds, something was happening to her, something dreadful to watch. “Our best looks like it was good enough.” Said Emma. The phantom, the monster who’d killed Sean, held her hands to her face and screamed. It was a human scream, the scream of a normal young woman. That made it hard to watch her disintegrate. It started with the skin on her face coming away, revealing the bones beneath. Emma watched, enjoying seeing the monster suffer. Not the others though, they were all looking away, as Natalie fell apart. The skull caved in, the pieces disintegrating as they fell away, becoming nothing but bone dust. Once her backbone had broken into several pieces, the screaming stopped. In just two minutes, three at the most. The monster that had been Natalie, was just a small pile of dust on the basement floor. “Christ ! What the hell was she ?” Asked Alex. No one was keen on picking up the sledgehammer, pieces of tissue were still stuck to the handle. He gingerly picked up the hammer, cringing as something disgusting dripped onto the front of his jacket. Three hits was all it took, to remove the door and present them with the darkness beyond. Emma aimed her flashlight into the cellar and ran it over the ground, a good thirty feet below. There was an endcap on the piping, but it wasn’t completely airtight. Some oil had bubbled through and coated the coils of piping. The pipes were heavy, slippery and difficult to move around. It took all four of them to push the pipes over the left side of the stairs. Below them there was a deafening crash, as the pipes hit the wooden tables, left behind by Dig Quest. And their clothes, Emma now stank of heavy oil. Dean had packed a few packets of wet wipes. The clean-up job was far from perfect, but everyone’s hands were less sticky. Dean had foreseen the obvious, which she’d failed to see. Work with pipes covered in heating oil and you’ll need something to clean your hands. It made her to question herself, her obsessive nature threatening to drive her crazy. What else might she have missed ? “Are you alright ?” Asked Dean. Alex had his hand on her arm. “You all feel it ?” She asked. Leonard and Dean merely nodded at her. Four flashlights now, searching out every corner of the cellar, as they descended the rickety stairs. Still no physical attack, still the feeling that she was letting everyone down in some way. It was just them, using her anxious nature as a weapon. She grabbed Leonard’s arm, as he raised the shotgun. It helped, letting a little anger out on Leonard. A poorly disciplined army wasn’t an army, it was just a rabble. Hermione was gliding across the cellar floor, looking over her shoulder as she arrived. “I’m sorry, I’m just a little edgy.” Said Leonard. Hermione ignored personal space, almost a capital offence during the times when she’d been a living person. The phantom leant in close, muttering rather than speaking clearly. The ghost vanished, as if she’d never been there. It was nice to know that she’d watch over Jerry, but how did she know where he was ? Had they all been watching her ? Did Eloise know he was in the old stables ? She grabbed Dean’s arm, trying to control her breathing. Oil again, covering her jacket as they tugged and pulled at the heavy coils of piping. It almost refused to straighten out at one point, until all four of them pushed down hard. She looked up occasionally, all too aware that they’re weren’t paying the enemy enough attention. There were shadows now near the altar, their malevolence could almost be tasted in the air. They were filling her head with anxiety. Where had she left the holdall ? Could its contents be damaged, perhaps even destroyed ? Emma fought the anxiety and its associated despair. It was going to work, had to work. It was a good idea, no one wanted to go into those dreadful tunnels, the ones where Hermione had met her end. Alex unscrewed the cap and oil gushed out, the pressure from the pump spraying oil over the walls. “Get it down there, before we’re drenched in the stuff.” She said. No stopping it though, as the end of the pipe twisted about, drenching them all in the foul smelling heating oil. Eventually the pipe went into the hole in the ground, landing in the tunnel below. Emma found it difficult to grip her flashlight, having to make a few attempts to aim it into the tunnel entrance. “It’s in there. I can see oil pouring out of the pipe.” She said. It wasn’t all she saw in the tunnel. He was there, the Hunter who’d given her his bow. Was he still an ally though ? She was in the process of burning his adopted home to the ground. He merely looked at her and nodded, before he too vanished. “Now the explosives.” Said Alex. No using wet wipes, trousers, shirts, all were used as hand wipes. Dean even used the top of his boxer shorts, to remove the sticky mess from his fingers. The holdalls were still at the foot of the stairs and looked undisturbed. Leonard quickly opened all three bags. The explosives were his area of expertise, he’d had the most exposure to Bo and he had a natural affinity for all things mechanical. “Timer device first, then the explosives.” He said. As he inspected the bags, another explosion was heard above them. The house had a gas supply and the builders had been using gas canisters in a few locations. It struck Emma that apart from briefly looking up, no one seemed concerned. They were warriors now, explosions were just a side issue. Now the phantoms would attack, she was sure of it, just as they needed to concentrate on placing the shaped charges. There was just one shadow near the altar as they approached and it quickly vanished. “I don’t like this. Why aren’t they attacking ?” She asked. “Just be thankful Emma, just be thankful.” Said Leonard. Alex took the shotgun and ammo belt, standing guard over Leonard as he began the process of placing the charges. Emma watched as he removed the protective strip from the adhesive and fixed the timer to the top of the altar. Leonard gave it a push and seemed happy that it was firmly attached to the stone. Next the shaped charges, which he placed and secured with some speed. Leonard was straightening out the cables, when Dean noticed something in the far corner of the room. It appeared out of the wall behind the entrance to the tunnels. It crossed Emma’s mind that there might be something behind that wall, perhaps the room where James Maynard had once practiced his dark arts. There was no way of knowing though, or time left to investigate. Soon it would all be either blown to pieces, or buried under the burnt ruins of Glade Hall. In the unintended picture she’d taken, the creature had looked almost nebulous, made of nothing but smoke. Now its claws looked all too solid, as they left deep furrows in the dusty floor. The eyes too were now far redder than in her picture and they were looking directly at her. “For God’s sake Emma, we can’t fight that thing !” Shouted Alex. Easy said, but she had no idea how to fight the monster that was gradually moving towards her. Dean had an arrow ready, watching her, waiting for an order to use the precious Hunter’s arrows. It hurt her mind to look at the creature. Its edges were ill defined, as though it wasn’t quite in their world, or existed in another at the same time. Its claws were real enough though and it was large, big enough to simply crush them to death. Everything about it was black and its size was still partly hidden in the darkness. Emma pointed her Maglite directly at the abomination. “Shall I fire ?” Asked Dean. It was larger than she’d thought, much larger. It seemed crushed into the corner, gradually pulling itself into the room. The claws weren’t just leaving furrows in the dust, they were scorching it. Small wisps of smoke were rising from its tracks. Light hurt the demon, if it was a demon ? The glowing red eyes closed as she ran her flashlight over its face. No detail though, again the impression that it was half in and half out of their world. Nick Goodwood hadn’t expected to find anything dangerous or nasty going on at Glade Hall. He’d only agreed to his nightly inspection, to keep Jerome Hooper happy. He drove on autopilot, letting his mind think of everything that needed to be done the following day. The Hoopers wanted a full security system put in after the refurbishment was completed. A fancy high-tech system that was well beyond his expertise, but he’s subcontract the work to someone he knew. “Never say no to a client.” He muttered. He might have noticed the glow in the sky, if he hadn’t been totally absorbed by his own thoughts. In the army he’d been courageous, in civilian life he worried about everything and anything. The stink of heating oil was the first thing he noticed, as he entered the driveway. Even then he put it down to the recent delivery by several tankers. Nick hadn’t even dressed properly, he was only going to drive through the estate and head for home. Slippers on his feet and wearing a worn out track suit, he began to notice the glow at the end of the drive. A light flickering on the trees that reminded him of something. His mind became instantly fully awake, no lingering worries about his commission on the security system deal. He accelerated, trying to look through the trees to his left, where he knew the house was located. He was doing about forty miles an hour, when he saw the van parked on the drive. No lights, nothing to tell him it was there. Nick slammed on his brakes and turned the steering wheel hard to the left. If he’d been watching the road, there was a chance his lights might have shown him the van. He’d been concentrating on the fire though and had braked far too late. The airbag inflated as he hit the nearside rear of the van. There was the terrible sound of metal grinding against metal. Terrible because he loved his car the way most people love their children. Nick saw nothing, his face still swallowed by the airbag, as his car went up on two wheels. It almost rolled over, but didn’t. No foot on the brake now, it crashed back onto four wheels and ran on. Finally his beloved car, found a large and well rooted tree to collide with. It was an unequal contest, the front of his car was crumpled beyond recognition. As the airbag deflated, Nick opened the driver’s door and fell forward onto the neatly cut grass. He was ok, nothing hurt and he still seemed to have very limb attached. His next thought was about the van. The fire was getting worse, the flickering flames illuminating two vans, one parked behind the other. There wasn’t enough light for him to see how much damage the collision has caused. The fire, the vans, none of it made sense. He was an ex-soldier, his mind quickly found an explanation. Jerome Hooper was a wealthy and well-known figure. Criminals or terrorists were attacking Glade Hall and he’d just driven into the back of one of their vans. Nick had received a few medals while in the army, or gongs as he liked to think of them. He’d met other men like himself at those presentations, men who’d been called courageous. Most were like him, taciturn men who just wanted a quiet life. There was the odd mouthy guy, revelling in tales of the people they’d killed. They were rare and had a look in their eyes. If the army hadn’t given them an opportunity to kill for queen and country, they’d have probably been dangerous criminals. For Nick, courage wasn’t something added to his personality, but something subtracted. Emma was at the house, probably with quite a few of her college friends. Something in his mind changed, switching him into combat mode. All his ridiculous anxieties went from his mind, along with fear and most of his instinct for self-survival. He still didn’t want to die, but it wasn’t high on his list of priorities. Nick was unarmed and limping, but he’d give his life if needed, to save Emma Hooper and her friends. Dean would never be a tournament level archer, but his target filled an entire corner of the room. The demon seemed to walk on two legs most of the time, but sometimes on four. Its form appeared to follow a cycle from being fairly nebulous to reasonably solid, or as solid as anything existing in two worlds ever can be. Dean shot the arrow when the creature was at its most corporeal. The arrow entered just below the two red eyes, passed through its body and hit the wall the other side, sending off a few sparks. Luckily none of them ignited the spilled oil, which coated that corner of the room. The demon flinched, if it was a Demon. Emma had read the detailed and often crazy notes that Nathaniel Maynard had dictated to Ginie. Some of it seemed far less insane now, especially about James Maynard’s trip into the Libyan desert. “Are you what followed him back ?” She muttered. The ancient city he’d found had once been the centre of a mighty nation. When most of mankind was still living in caves, they had created a fabulous city out of stone. Their deity wasn’t a vague article of faith, but a living creature born of fire. Nonsense of course, just a mad legend repeated by a very sick mind. Was Nathaniel right though ? Their deity had eventually been that city’s undoing. Proper respect wasn’t shown, or maybe it had just grown bored of them. The creature born of fire had destroyed most of the city, scattering the survivors into the desert sands. Was that what they faced, the deity that had destroyed an entire city ? As sometimes happened in Glade Hall, the truth seemed to be given to her, implanted straight into her memory by some unknown force. “You’re no God !” She yelled. It looked a little grey in places. The Hunter’s arrow was hurting it, but looked unlikely to prove fatal. The Libyan deity looked hurt though and moved again. It was moving towards her, its eyes never leaving her face. Alex just behind her, holding out a cloth strap, full of grenades. She took it from him, wondering where Alex of all people had acquired them. Bo of course, the seller of all things bang and boom had been to see them. She turned and the monster was gradually edging closer to her. It might normally have been able to run, but fitting into the cellar was effectively crippling the creature. A bluff of course, she had no idea what manner of creature it was. Probably something else that didn’t fit into any known list. It was angry, swinging a massive claw in her direction. There were pillars though, restricting where it could reach. It used its own body as a battering ram, pushing hard at one of the stone pillars. As it pushed, dust began to fall from the ceiling above. “It’ll bring the roof down on us !” Yelled Dean. Emma had no clear throw with a grenade and she didn’t want to risk one going down into the tunnels full of oil. He put down the bow and caught the grenades. The monster was becoming angrier, pushing the pillar and raking the wall with its claws, leaving furrows that glowed red hot. She looked back at Leonard, still clicking cables into connectors. “How long ?” She asked. He was concentrating and might not have even heard her. Emma had intended to throw just one grenade, slow the creature down, give them a few more precious minutes. She looked back and the monster from the Libyan desert had almost pushed over the pillar. It roared at her for the first time. A deep sound that made the entire cellar vibrate. He’d misunderstood and there was nothing she could do about it. Instead of throwing one grenade, Dean had quickly pulled the pins from them all and was about to throw the entire strap at the creature. No good ! Too late ! Emma knew what was going to happen and there was no way to avoid it. She turned towards Alex and Leonard, dropping to the ground as she did so. “Down ! Get down !” She shouted. Bo didn’t sell anything ordinary. She had no idea what explosive was used in the grenades, but thought it was probably on a classified list, somewhere. She had her hands over her ears, but the shockwave still hurt her eardrums. Pieces of rubble hit her entire body, some knocking the wind out of her. By the time she felt the heat on her back, Emma was almost resigned to dying where she lay. Everything hurt and there was blood on her face, her blood. Alex and Leonard were there, moving about, but still covered in rubble. What about Dean ? He was closest to the blast. As she turned her mind tried to escape from what she saw. What ifs became her route to some kind of sanity. What if Alex had bought ordinary grenades ? What if she’d told Dean to just use a single grenade ? What if her parents had never bought Glade Hall ? It was no good, she had to face the ghastly reality. Dean was on fire, all of him. It was kind of fire there was no coming back from. No loophole, no sudden rescue, no cunning plan. He was burning with an intensity that meant death. By some miracle he was still on his feet. It took her a moment to realise that the loud noise in her ears was Dean screaming. They were going to get married, she’d decided he was the one. Others might die, but not Dean. Emma buried her face in the rubble, hands hard against her ears. She justified her actions as waiting for the intensity of the fire to burn down. It didn’t though, the heat on the back of hands grew, until she had to get up and move. The monster had gone, or at least blown to fragments, or perhaps thrown back to the other world it had come from. The flames roaring up out of the tunnels were white hot and she was finding it difficult to breathe. It was no good, he’d gone. Fearless Dean Jenkins had been completely consumed by the flames. The journey home from Paris had been frantic. A scheduled flight to London City Airport and then a helicopter to Oxford. Money can achieve just about anything and hiring the helicopter had cost Jerome Hooper a staggering amount of money. Everything was already booked out, so Jerry had bribed a pilot to break an existing booking. Sounded sensible, unless your wife might well have a nervous breakdown while waiting. He could have almost bought the helicopter, for the amount it took to bribe the pilot. Luckily the weather was still good, visibility almost perfect. The pilot refused to take them to Glade Hall though. Jerry and Alice Hooper were dropped off at Oxford Heliport with their luggage. A large fortune and an Amex card can work wonders though and a few phone calls obtained a hire car. It wasn’t exactly top of the range, but the car hire company had delivered the four year old Ford to them, at close to midnight. After giving the delivery driver a good tip, Jerry put their luggage in the trunk and headed north on the A44. He too had a bad feeling about Emma, as he drove past the Copper Kettle and saw the glow in the sky. Another mile driving far too fast for the road and they could see the flames. It seemed as if half of Oxfordshire was alight. No blue lights though, no emergency service vehicles waking everyone up with their sirens. The house was isolated and in a cell phone dead zone. “Yes, the dead zone.” He said. Jerry put his foot hard on the brakes, causing several long rubber stains on the road’s surface and a deafening screech. One bar on his phone and an odd sound when he tried to call the emergency services. He’d seen someone do it on a movie, but had no idea if it worked. The only alternative was to drive back into the village. He climbed onto the trunk of the car and carefully clambered onto the roof. It took a while and some of the questions asked were downright frustrating. Eventually he had a promise that the fire brigade were on their way and a little ominously, the police and ambulance service too. He wanted to try Emma and Dean’s cell phones, but thought the delay might cause his wife’s head to explode. He came off the car roof in a controlled fall, landing in a heap on the road. Jerry saw the vans parked on the driveway and drove round them. Following the driveway took him to the rear of the house, past the chapel. Everything seemed to be on fire. The heat was unbearably intense, even a good twenty yards from the house. There were one or two cars that seemed to be left in the car park twenty four seven. Maybe they belonged to Nick’s guys, he didn’t really know. One was already on fire, the second beginning to smoulder. Luckily the wind was blowing the smoke north and away from where they sat in the elderly Ford. He wasn’t that surprised when Alice opened the car door. She was off, trotting towards the house, ignoring the blistering heat. Jerry had to run, catching her, folding his arms round her. All the expert refurbishment, all the skill put into restoring every eighteenth century panel, all the millions to buy the house. It was all burning, roof beams already falling into the inferno that had once been their home. Glade Hall was dying. His hold on his wife became a hug, rather than restraint. The pain was unexpected and for a few seconds, it was completely debilitating. Alice, his wife, the mother of their children, had rammed her knee into his testicles. Jerry fell to the ground, trying hard not to vomit. It would pass, he knew that. It had been a long time since he’d been hit in the balls, but he knew the pain and nausea were only temporary. By the time he was upright, Alice was running and she could run fast when she wanted to. His wife was heading for the only part of the house not completely engulfed in flames. The only part that didn’t look like a deep level of Dante’s vision of hell. Emma tried to get the image of Dean dying out of her head, but it refused to go. She helped Alex remove the rubble that covered his legs. He looked fine, but kept holding his stomach. “Are you alright ? Can you walk ?” She asked. There was no need for her flashlight now, the burning oil provided better illumination than the cellar was ever likely to have had before. Emma just hoped the fire kept the rest of the shadows at bay. Looking up, she noticed a troubling amount of black smoke, accumulating against the ceiling. It was worrying and every breath seemed more of a struggle. Leonard was up on his knees and fully alert. She’d once considered dropping Leonard from the group, only the risk of upsetting Alex had stopped her. He just seemed so insipid at times, lacking in energy and drive. Yet there he was, checking the explosives and fixing the last cable. He was coughing, the air now seemed to be half oil fumes. Otherwise Leonard seemed fine. She kissed him on his grubby forehead. Alex was still holding his stomach, blood now covering his fingers. The brick had done more than just wind him, but she’d worry about that once they were outside and able to breathe properly again. She shook her head, hoping that would be enough for him to understand. Alex was looking around as he stood. Tears now as she angrily dragged Alex towards the stairs. Without the light from the various fires, she’d have never seen the silent battle. Way out past the stairs, in an area that even Dig Quest hadn’t excavated, Lydia was keeping her promise to help. She had her arms around the creature that had once James Maynard. Her darkness engulfed him, kept him pressed against the stone cellar wall. “Why have we stopped ?” Asked Alex. Alex looked where she was looking and saw nothing, shaking his head at her. There may have been sounds she couldn’t hear, yet to her the struggle was going on in complete silence. James was hitting smaller shadows, knocking them away, only for them to run at him again. Alex was putting more and more weight on her, they had to hurry. She was fascinated by the battle though. Not a physical battle really, but a battle of spiritual darkness. Lydia seemed to be winning, but that might not last. She half dragged Alex, wondering why Leonard wasn’t moving towards the stairs. Leonard just knelt there, his hand on the timer. The black smoke was getting thicker, now threatening to fill the area at the top of the stairs. They needed to go, she just didn’t want it all to have been for nothing. 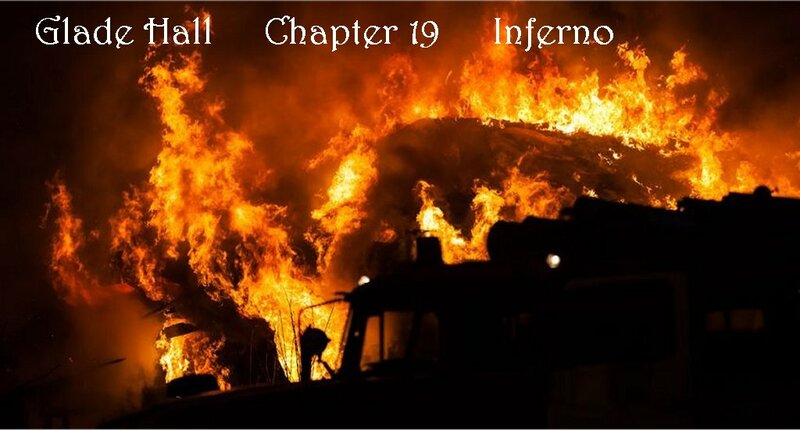 Burning Glade Hall would damage the shadows, with luck it might even send James Maynard to oblivion. It would only slow ‘them’ down though, the old dark gods who inhabited The Glade. A century or so was nothing to them and then they’d be back again. “Can you fix it ?” She asked.